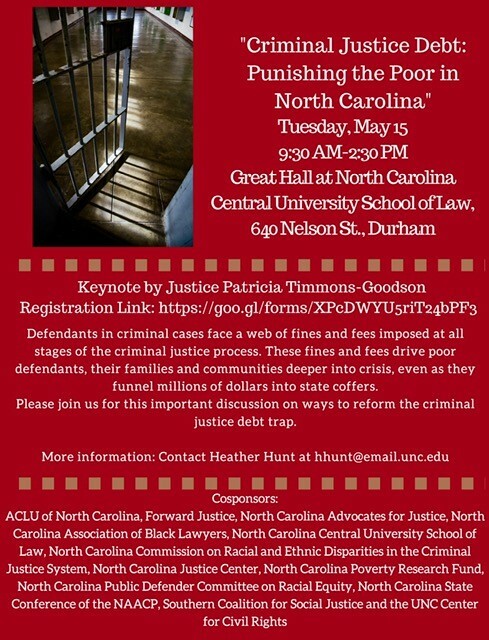 Conference: "Criminal Justice Debt: Punishing the Poor in North Carolina"
Defendants in criminal cases are caught in a web of fines and fees imposed at all stages of the criminal justice process. For poor defendants, these costs are often unpayable. Set up to fail and sanctioned with additional fees, extended probation, license revocation and–in violation of constitutional law–jail, individual defendants, and their families and communities, are driven deeper into crisis, even as they funnel millions of dollars into state coffers. Please join us for this important discussion on ways to reform the criminal justice debt trap. The N.C. Poverty Research Fund is hosting the Spotlight Conference: “Criminal Justice Debt: Punishing the Poor in North Carolina.” The purpose of the N.C. Poverty Research Fund is to explore, document and research the immense challenges of economic hardship in North Carolina. Through generous foundation and private support, the fund hires undergraduate, graduate and postdoctoral students and faculty to probe the causes of and solutions to economic injustice in the Tar Heel state. Cosponsored by ACLU of North Carolina, Forward Justice, North Carolina Advocates for Justice, North Carolina Association of Black Lawyers, North Carolina Central University School of Law, North Carolina Commission on Racial and Ethnic Disparities in the Criminal Justice System, North Carolina Justice Center, North Carolina Poverty Research Fund, North Carolina Public Defender Committee on Racial Equity, North Carolina State Conference of the NAACP, Southern Coalition for Social Justice and the UNC Center for Civil Rights. The mission of NC-CRED is to identify, document, and alleviate racial and ethnic disparities in the criminal and juvenile justice systems.